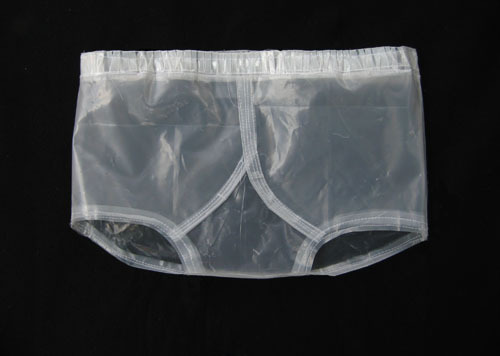 Artist James Gilbert will set up a temporary sewing shop in the CAF gallery and sew several hundred real size pairs of unique clear industrial plastic see-through underpants, which will accumulate in huge sculptural piles around him. The accumulative sculptures (representing media information) become more present throughout the performance. This accumulative performance project addresses ideas of privacy, anonymity, and identity in relationship to the huge amounts of intimate personal information posted daily on Facebook, YouTube, Google and other mass media. Gilbert is a Los Angeles based artist who works across mediums creating drawings, installations with video, and performative art. These works comment on social themes, including identity and anonymity in a media saturated culture where privacy has been eroded by reality television, social networking sites and 24 hour news cycles. Gilbert has exhibited in galleries and museums nationally and internationally in the United States and Asia. Recent 2010 exhibitions include a large scale site specific solo installation including fifteen videos at the Dallas Contemporary Museum and Platform4 in Aalborg, Denmark with upcoming projects in Los Angeles and Bogota, Colombia. Support for Forum Lounge is generously provided by: Endevermusic Productions, the Franciscan Inn, KCSB, Santa Barbara Winery, and the Santa Barbara Independent. Forum Lounge is presented in association with the Santa Barbara Downtown Organization’s 1st Thursday.